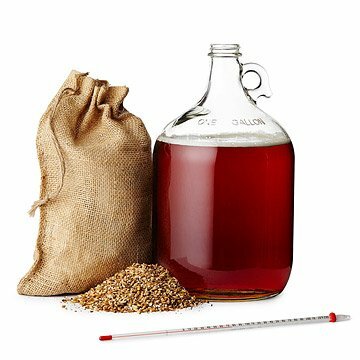 This kit has everything you need to brew your own Oktoberfest-style ale. Isn't it time you made the leap from beer drinker to beer brewer? Get off the sidelines and turn your kitchen into a craft brewery where you're the brew master and your friends and family are the master taste testers! These boldly designed, premium brewing kits use 100% malt extract, world-class specialty grains, fresh hop pellets, and high quality yeast: that's everything you'll need to create the kind of pints you'll have no problem polishing off. Inspired by traditional beers quaffed during Oktoberfest, this malty ale has a light copper hue, subtle bitterness from its Perle and Mt. Hood hops, caramel sweetness, and a clean, dry finish. The kit makes one gallon, or ten 12 oz. bottles. Assembled in Orlando, Florida with US-grown ingredients. My friend is excited to give it a try. She loves the idea. I even bought 2 more different kinds of kits!! This was my first attempt at brewing beer and I really enjoyed doing it. The Oktoberfest was great, looking forward to trying a new brew! My brother has always been interested in beer. This kit will allow him to easily create his own first batch, he will be so proud that he made his own beer at home! We love it. Fast delivery. Everything there to start and great beer. He thought this was the coolest gift ever. He can't wait to make his own beer. I stumbled on this site shopping and it is great. Quality products and lightning fast shipping. Everyone who received one of these gifts were impressed. All of the items I gave as gifts were hits. I gave him several beer kits from Uncommon goods and he has liked them all. He has only been brewing his own for a couple of months, but finds these kits and the beer diary I also got here very helpful. My sister went to Oktoberfest in Germany last year so I got this for her birthday. She said it tasted just like the beer she had abroad and we had a blast making it!